For the KeyBank Center in Buffalo, New York, see KeyBank Center. Key Bank Center, formerly the Puget Sound National Bank Building, is a 16-floor high-rise in Tacoma, Washington. 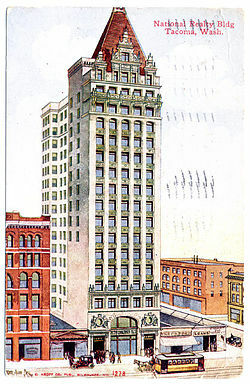 When completed as the National Realty Building in 1911, the 71 m (233 ft) tower was the tallest building in the state of Washington until surpassed by Seattle's Smith Tower in 1914. Key Bank later sold the tower and moved into the building at the corner (1101 Pacific) which now houses the South Puget Sound District Offices of Key Bank as well as its Tacoma Main Branch office. The tower, with marble quarried in Alaska, was designed by Frederick Heath. ^ "Key Bank Center". SkyscraperPage. ^ June Allen (20 October 2004). "The State Capitol and Its Marble and Keeping the Capital in Juneau". Stories In The News. Retrieved 26 August 2010. Key Bank Center is located in Tacoma and was only the tallest in Washington when completed. This page was last edited on 6 May 2018, at 12:34 (UTC).